Day two: The three of us headed to Sewfisticated to browse their bridal fabrics… and found two beautiful silks. And we finished the bolt for both: a matte, sheer silk for a soft, flowing outer layer, and rich, shiny silk with great hand and drape for the under layer. (For extremely affordably, too). So we let Jennah get back to studying, while we ironed, cut and began sewing in the fashion fabric, before my bus back to Maine. Above left: Julia ironing the sheer silk (the black print shining through is on the ironing board), and above right: rotary cutting extended (slashed and spread) pattern pieces for a ruched outer layer. 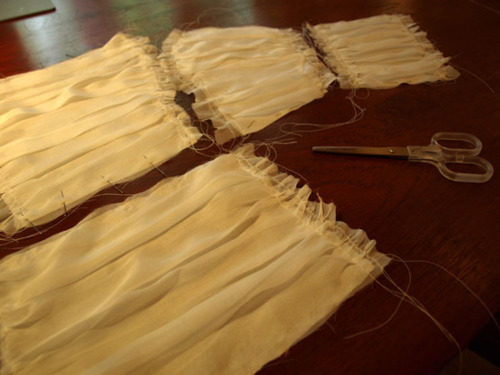 Below: A bodice in the making! The sheer silk ruched, and stitched down on the shiny silk under layer. …and now, a break until next time the three of us end up in the same city!